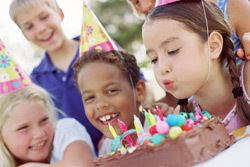 Celebrate an exciting Birthday Party at Cool Crest! We offer food and fun for guests of all ages. We take care of all the details – so you can have a blast without worrying about the clean-up! Celebrate, and let us do the work! Cool Crest offers a number of affordable and flexible packages available for parties of just eight or more. Conveniently book online in 5 easy steps! Create a memorable birthday experience that will last a lifetime! NEW FREE Birthday Party Invitations! Tell your friends about the upcoming event! GET $10 OFF EVERY PARTY! Get $10 Off Any Party with downloadable web coupon for a limited time only. Plus, Get 100 Free Arcade Tokens When You Book Your Party To Be Held Monday-Friday! Playtime Birthday Party Package – Top Seller! MEGA Birthday Party Package – NEW! Please call to book your party if you have any guests that require special needs to ensure that we can accommodate them properly. Parties may bring their own birthday cake, but other outside food or beverages are not allowed. Appropriate Footwear Required for Rider and Driver. Closed Toe Shoes Highly Recommended for Your Safety. Options require a Birthday Party and are not sold separately. Reservations are required more than 48 hours in advance with a $50 deposit. Reservation deposit is not refundable. Visa, MasterCard, AMEX and Discover are accepted. No personal checks. Parties may bring their own birthday cakes, but no other outside food or beverages are allowed. Pricing and packages may change without notice. Not valid with any other discounts or offers. Safety and height restrictions apply to all attractions. Attractions may close due to weather, repair or maintenance. Substitutions may be made at the discretion of a manager. Please call for details.